As most of you probably know, we have been waiting to get a puppy since last Sunday. After having to take our old dog, Spencer, to the Humane Society we (more like me and Hannah) have been wanting to get another dog. 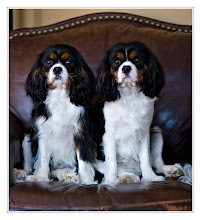 Last Sunday we visited a breeder who had Cavalier King Charles Spaniel puppies- perfect dogs for family life. As soon as we saw them we all feel in love. We knew we had to get one. 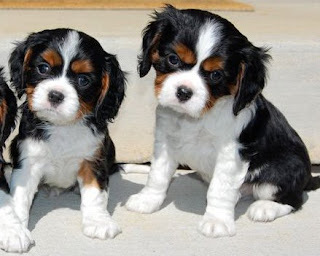 Mom and Dad said we would get one on Saturday (secretly planning to surprise us after school on Friday with the puppy). Well, Thurday afternoon I was walking to the car after a long day of school. I tossed my backpack in the car and my mom told me to look down. I looked down and all I saw was a box. I thought it was just a regular box, until it moved. I slowly opened the lid to reveal TWO adorable puppies!!! You have no idea how excited I was! I immediately went to show my friends the puppy I had waited for and then had the whole school surrounding me and my little dog. After school we went to PetSmart to get all the supplies. Once again, almost everyone wanted to know about the two brothers. We decided on the names Bailey and Brody, and they are already learning their new names. Sorry there aren't more pictures. I'm doing this before school and I don't have enough time. I'll make sure there are more by tomorrow.